Two years and running strong, Jovos at NIBM continues to be our pick for the quirkiest, coolest and funkiest gastropub in town, serving unimaginable fusion food, plated in the most bizarre way possible! Located on the ground floor of Bizz Bay Mall, the entrance to Jovos boasts of dual Zeus figurines in elegant reclining posture. Behind it, is an amusing caricature of Albert Einstein on the glass window with small-big speech balloons containing words like ‘vodka’, ‘beer’, ‘shots’ and more! Jovos in Hungarian, means future. Holding true to its idea of a futuristic concept, the interiors, basking in multi-colour lights, is a combination of everything intriguing – fascinating graffiti featuring 90’s fave Johnny Bravo and Dexter, film posters, a hanging plate collection, tan-brown chairs and tables, swing sets that double up as bar seats, comfy sofas and cute cushions in bold colors. Jovos has an immediate feel-home vibe! We spotted a cube shelf of over 95 shot glasses, collected from various parts of the world. The two-storied gastropub has a quaint corner stage for their weekend gigs and karaoke nights. While most of the cafes go the mundane way of laying down table mats or cloth serviettes, Jovos has its own ways of breaking the rules. Enter bubble wrap mats – an extremely clever way of keeping the patrons busy until the food arrives! What’s more? 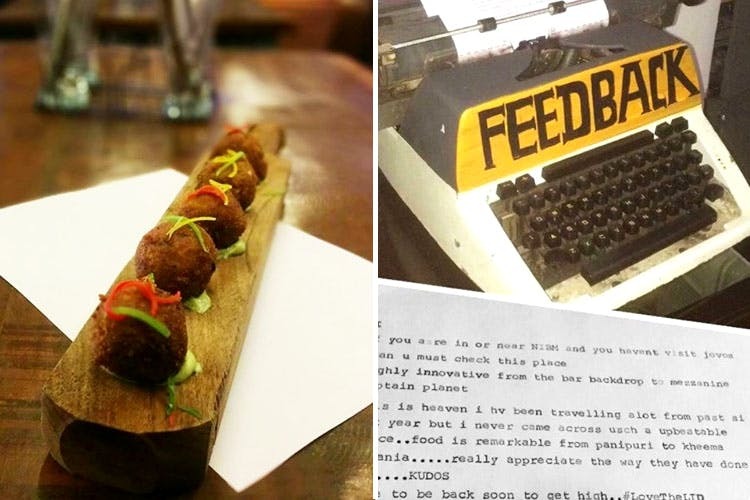 Write all about your Jovos experience on a typewriter! Because writing reviews on a phone or a laptop is so not fun. At Jovos, food is treated no less than art. The menu features a range of eccentric yet delectable fusion delicacies. But for us, the true Instagram-worthy moment was the mind-boggling presentation. Brimming with versatility, this place plates your food in and on all sorts of things – from laundry bats to test tubes, beakers, earthen and mason jars, syringe and frying pans! Though many of you are already familiar with it, we cannot help but mention the classic Jovos pani puri. Crispy puris filled with spicy mashed potato fillings, this creation is served with six variants of fruity pani, including orange sweet chilli, mango mint and coriander kokum, in test tubes. The bestselling shot gun chicken sprinkled with gunpowder, served on a small-sized laundry bat, for INR 160 is yet another must-try at Jovos. Foodies, pair your chilled beer with their grilled fish on satay sticks smeared in peanut sauce. Ever heard of cheat meal chaat? You got to try their crunchy tiny samosas in shot glasses, served with a side of hummus, accompanied by garlic and tamarind chutney inside a syringe! Give your beloved appetizer a desi twist, and dig into some mouthwatering cheese pav bhaji fondue for and DIY masala papad. Wash down your plate of bar delights with Jovos signature cocktails. We highly recommend you try the lolly-ta, a combination of tequilla and kala khatta and the kadak chai, a unique blend of tea, cucumber and gin. If you’re feeling brave, try the exotic cocktail – Brahma gets its wings, a mix of gin, white rum, vodka, green apple and mint. Don’t miss on to some of their best offers like the ‘buy two, get one cocktail free’ and ‘vodka shots starting at INR 99/shot’. An evening at Jovos with the squad is worth every penny! Lip-smacking food coupled with mean cocktails on a fun karaoke night, are everything you need after a rough day at work. So don’t think too much, book your table tonight and let the good times begin.